The Town has been recognized for the fourth year in a row by the Government Finance Officers Association for its financial reporting. The award, bestowed for the Town’s 2014 Annual Report, honours excellence in governmental accounting and financial reporting. 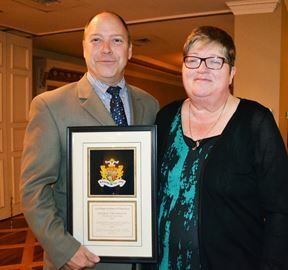 Pictured are Lord Mayor Pat Darte presenting the award to the Town's Manager of Finance, Brenda Garrett. At its February 8 meeting, Council approved the formation of a Sesquicentennial Committee that will co-ordinate and support events in NOTL during Canada's 150th in 2017. With the support of Town staff, the committee members appointed will be reporting back on a terms of reference and budget. Niagara Region's Commissioner of Planning and Development Services attended the February 8 Council meeting. The Commissioner's presentation discussed the Region's Municipal Comprehensive Review, which addresses its 2041 Growth Strategy, Water and Waste Water Master Servicing Plan, and Transportation Master Plan. A zoning amendment for 552 Lakeshore Road to Agricultural Purposes Only to prohibit the development of the lands. A zoning amendment for 1532 Concession 4 Road. A Draft Plan of Subdivision will be considered at a later date. Revised Terms of Reference for the UNESCO Committee to reflect the number of members and roles and to appoint Peter Kavanagh as a member. A Subordination Agreement between the Town, Ontario Infrastructure and Land Corporation, and Niagara-on-the-Lake Hydro Inc.
A by-law to provide for the Town's interim levy of realty taxes for the year 2016. A motion to appoint Janet Trogdon to the Active Transportation Committee to fill a vacancy on the Committee. A Special Event Permit for "Vintage on Ice" in Simcoe Park on February 27 for an ice sculpting competition. A motion directing Town staff to liaise with Niagara Region staff to investigate a safety plan at the corner of Line 3 Road and Four Mile Creek Road to establish flashing red stop signs and to report to Council on the costs necessary to carry out this work. A motion directing staff to review potential capital projects that could be "shovel ready" in anticipation for future funding from the federal and provincial governments. Volunteers are needed for the Town's Snow Removal Assistance Program. Please contact the Operations Department at 905-468-3266 if you are interested in helping. Senior or physically-challenged residents may also contact the Town to sign up to receive this service. Further details are available here. The Working Group of the Town’s War of 1812 Bicentennial Committee has received a $150,000 capital grant from the Ontario Trillium Foundation for the Landscape of Nations Native Memorial at Queenston Heights. See the media release for further details. NEW YEAR'S DAY LEVEES - Lord Mayor Pat Darte joined other dignitaries and hundreds of guests to usher in the new year at the annual New Year's levees at the Royal Canadian Legion Branch 124 and Fort George on Friday, January 1. Photo courtesy of Tony Chisholm. CRIME STOPPERS FLAG RAISING - Representatives of Crime Stoppers of Niagara visited the Town Municipal Offices on January 11 at 11:30 a.m. to raise their flag in recognition of Crime Stoppers of Niagara Month. Visit www.niagaratips.ca for more information. NIAGARA ENTREPRENEUR GALA AWARDS DINNER - Tickets for the 2015 Niagara Entrepreneur Awards Dinner are now on sale. The award ceremony, which will be held at the Marriott Gateway in Niagara Falls on Friday, February 26, 2016, honours Niagara’s elite entrepreneurs. Nominees from Niagara-on-the-Lake include: Chris Pontsioen and Matt Swan of Silversmith Brewing Company; Nicole Pajak of Small Batch Co; Dina Mavridis and Robert Burke of Something Something Productions; and John Vetere and Tania Ganasinni of The Norton Underground. Please visit www.niagaraentrepreneur.com for ticket information. NIAGARA PUMPHOUSE ARTS CENTRE - The Pumphouse Instructors' Exhibition will continue until March 28, 2016, and a number of art classes are also available during their winter session. For more information on classes, lecture series, and workshops, call 905-468-5455 or e-mail office@niagarapumphouse.ca. WILLOWBANK CENTRE - Willowbank Centre is presenting the "Telling Heritage: A Lecture Series" featuring a number of lectures throughout February and March. Visit Willowbank's website at www.willowbank.ca or call 905-262-1239 ext. 21 for more information.